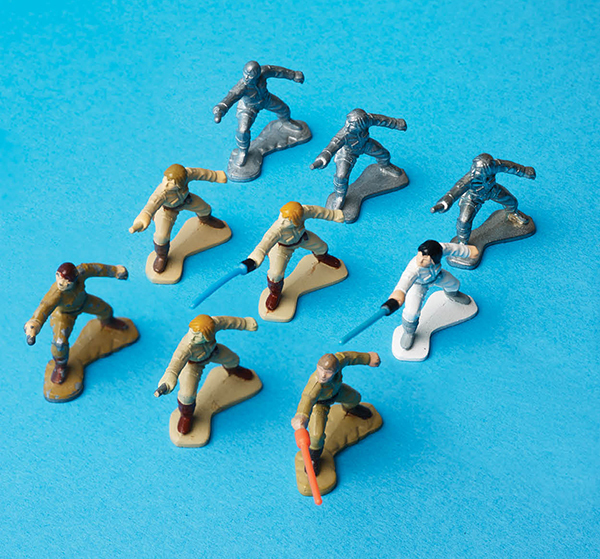 Kenner Products hit lightspeed when it unveiled its original line of Star Wars action figures in the late ’70s, turning legions of fans into fanatics. Nearly four decades later, on the eve of yet another installment of the film franchise, that old force is still going strong. The “galaxy far, far away” that birthed the enduring Star Wars mythology turns out to have been much closer to Cincinnati than most people realize. Right downtown on Vine Street, in fact, in the present-day Kroger Building. 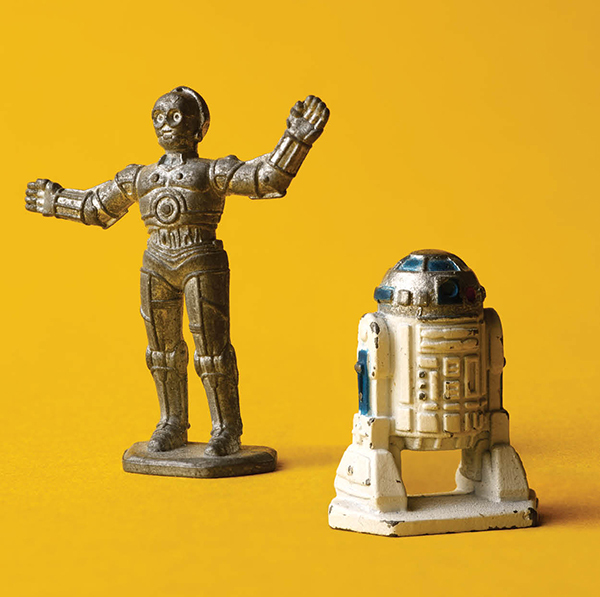 Kenner Products—the original creator of all those brightly colored, intricately detailed, 3¾-inch plastic action figures unleashed on pre-teen geekdom with the debut of 1977’s Star Wars, 1980’s The Empire Strikes Back, and 1983’s Return of the Jedi—was based here until the year 2000, when new owner Hasbro moved operations to Rhode Island. 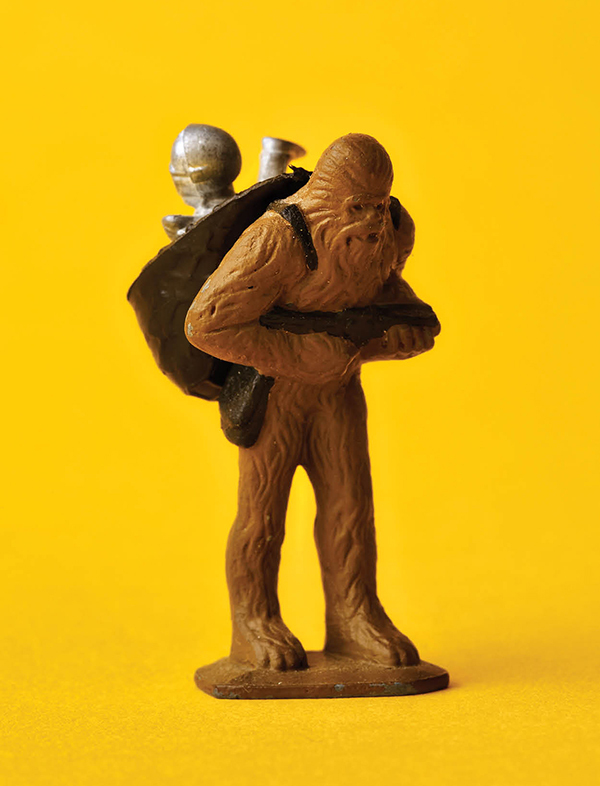 But in the short span of eight years, Kenner’s replicas of Luke Skywalker and Jabba the Hutt, X-wing fighters and Death Stars, Wookiees and Jawas revolutionized toy culture in much the same way that Star Wars revolutionized cinema. 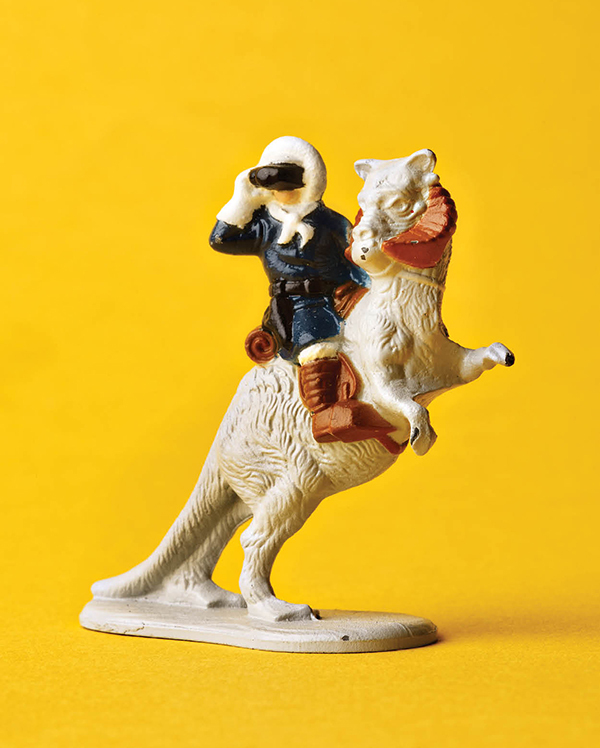 Their small size, pliability, copious companion gadgetry, and cool embrace of spacey futurism spawned generations of Padawan consumers who then morphed into collectors. 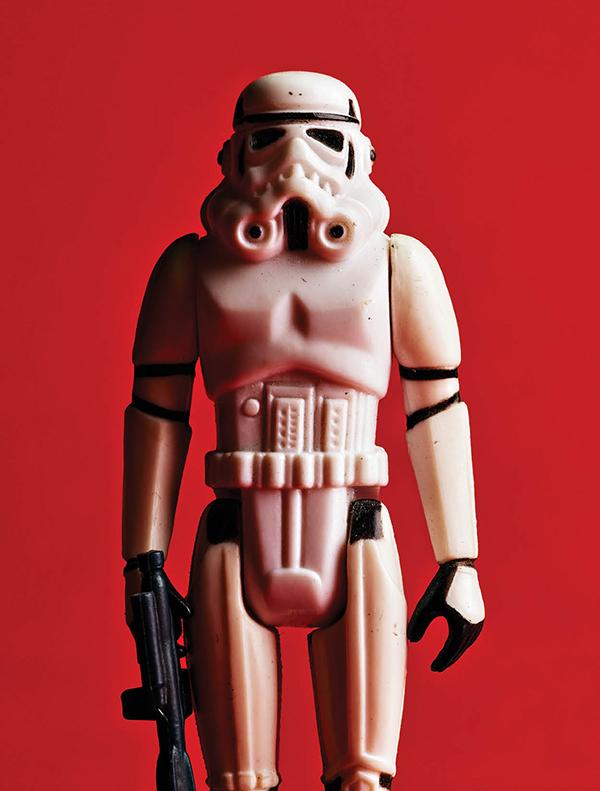 From 1978 to 1985, Kenner sold more than 300 million Star Wars–related toys. It staggers even a Jedi’s mind. 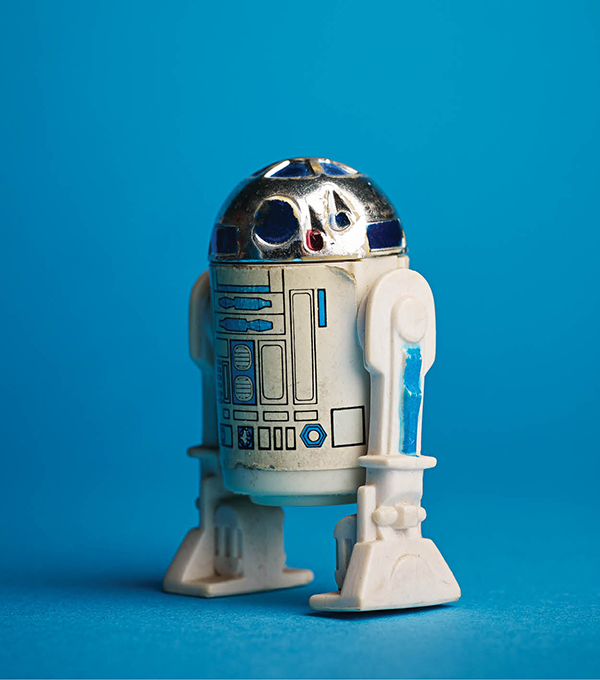 R2-D2, from Kenner’s original series of 12 action figures released in 1978. From Dan Flarida’s collection. Now, 30 years on, with the original trilogy’s story line set to resume with the release of Star Wars: The Force Awakens, in theaters on December 18, some of these collectors are dusting off their old playsets and checking to see what a mint condition Millennium Falcon fetches on eBay. Harrison Ford, Carrie Fisher, Mark Hamill, and even C-3PO, R2-D2, and Chewbacca are all reprising their roles, along with a host of new characters. And just as the force of those early toys—and newly created ones—is being reawakened, so too is the history of the greatest pop-cultural product to come out of the Queen City (unless you consider soap a form of entertainment). The toys made by Kenner are as much a part of the Star Wars legacy as the films themselves, if not more so. For collectors, discovering a rare, still-in-the-package Obi-Wan Kenobi with a fully extendable lightsaber is the psychological equivalent of finding Rosebud from Citizen Kane. 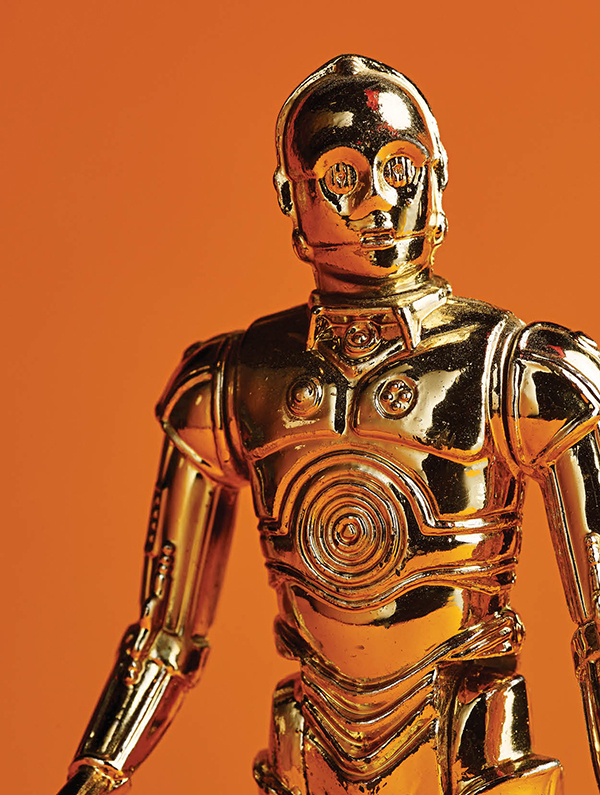 C-3PO, from the original 1978 series. 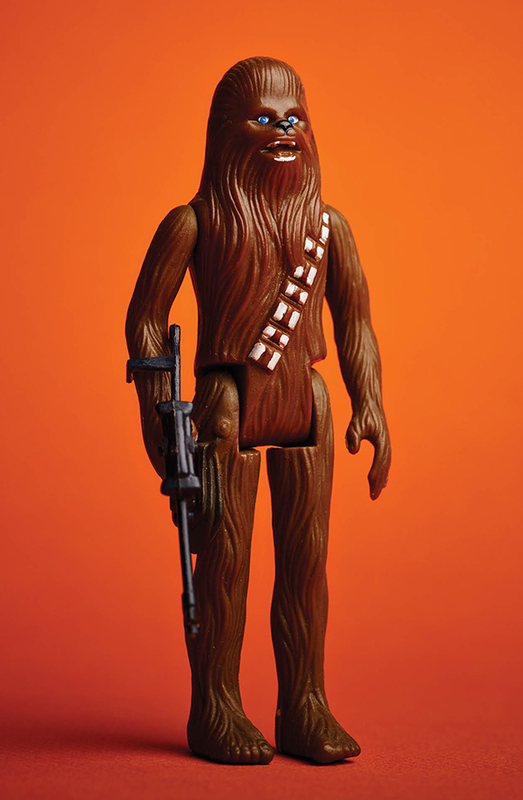 Chewbacca, from the original 1978 series. “To be able to put yourself into a world you saw on screen, to act out those scenes or create your own, was an amazing concept,” says Dan Flarida, creator of the website kennercollector.com. He still cherishes the memory of the action figures his parents once bought him, though it wasn’t until later in life that they became a serious interest. Flarida remembers purchasing a Return of the Jedi–era Darth Vader figure for $15 from a local flea market in the early 1990s. He put it in a drawer for safekeeping, then more or less forgot about it after joining the Air Force and going off to college. When he returned, he found it still unopened, and his collector’s gene switched on. Today, the basement of the home Flarida shares with his wife in Lebanon is, as he describes it, “toy-focused,” though at 43 he doesn’t go down there after dinner to act out scenarios with his favorite characters like he did as a boy. 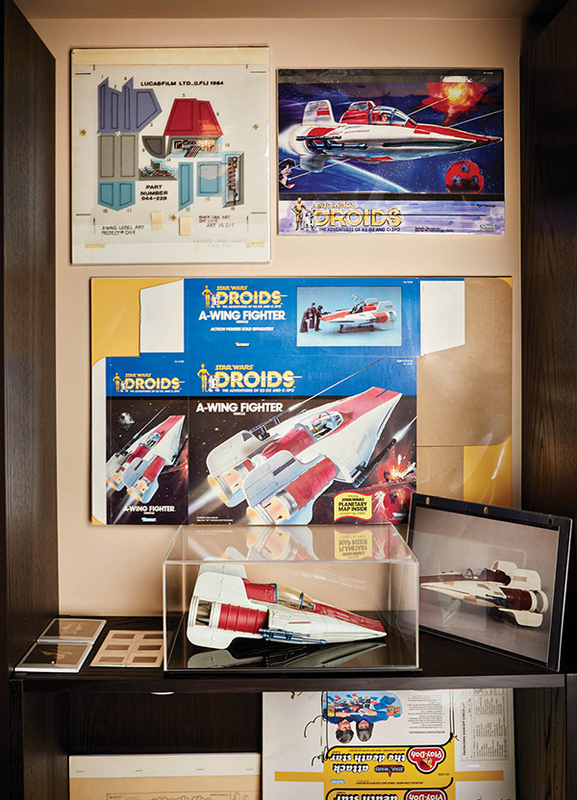 Instead, he displays the toys, in their original packaging when possible, on rows and rows of shelves—things like his complete set of 62 “Power of the Force” coins from 1985, or the original hand-painted A-wing ship prototype that was photographed for the toy’s box images. It’s a museum more than a playroom. 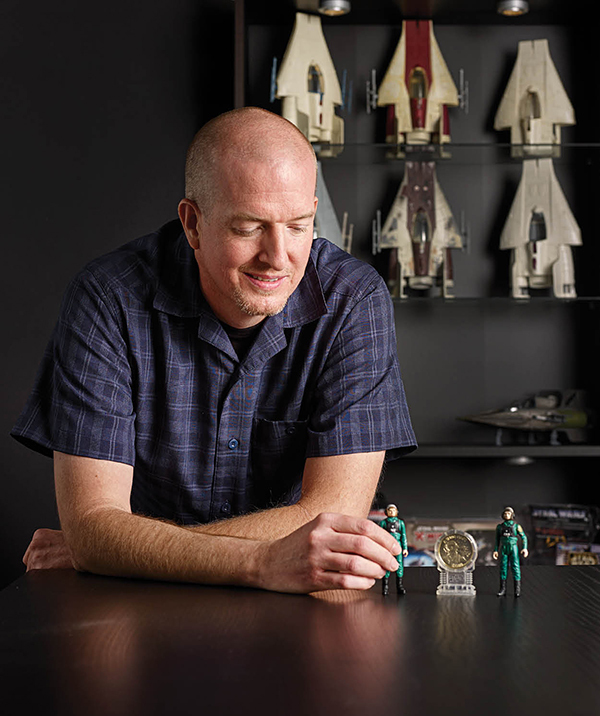 Friend and fellow collector Josh Blake shares the same passion, as his collection of roughly 500 vintage Star Wars toys, each released from 1978 to 1985, makes evident. 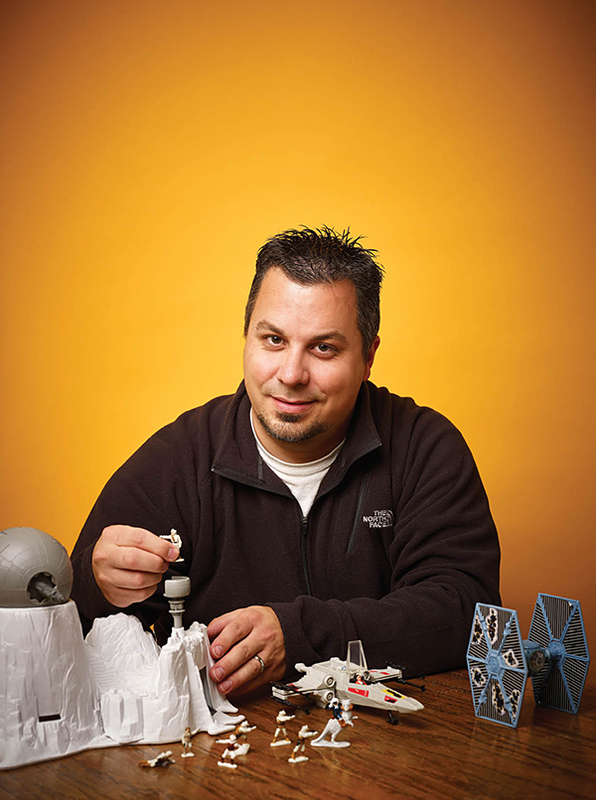 He’s especially proud of those depicting Luke Skywalker as an X-wing pilot, and his specialty is acquiring prototype models of a short-lived 1982 line called the Micro Collection, which consisted of nine playsets of smaller figures just 1¼ inches in height. It’s a communal culture, with collectors of all ages stretching from here to the furthest marshes of the Dagobah system. To wit: The main branch of the Public Library of Cincinnati and Hamilton County has a Kenner Toys exhibit curated by Flarida and Blake on view through next month. It runs the gamut of Kenner’s toy production over the years with a special focus on their brilliant commodification of that faraway galaxy, including a “Star Wars Day” on December 12 with talks by toy designers, a screening of the documentary Plastic Galaxy: The Story of Star Wars Toys, and a green screen photo booth for kids in the library’s new MakerSpace. “We fancy ourselves as museum curators and toy archeologists,” says Blake, who is 36 and lives in Lexington. 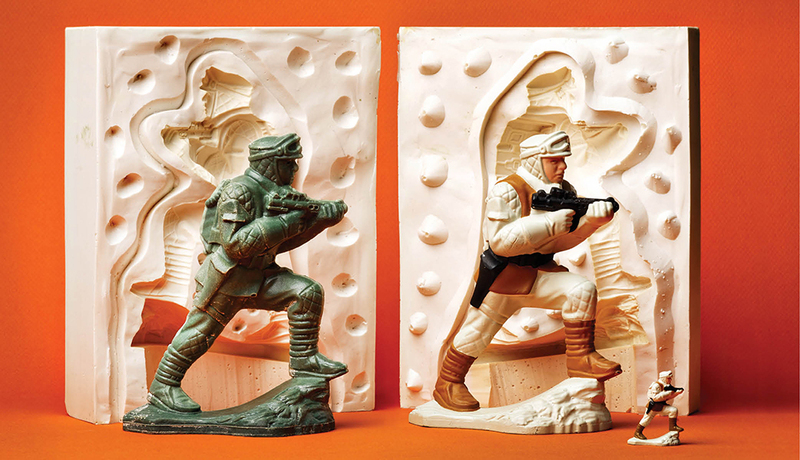 “If I own it, I have a responsibility to the community to preserve that to the best of my abilities.” A defining period of pop cultural influence forever encased in hard plastic—which, much like Han Solo frozen in carbonite at the conclusion of The Empire Strikes Back, will never die. Kenner Products was founded in 1946 by brothers Albert, Philip, and Joseph Steiner, according to Philip’s son Corky, himself a longtime Kenner employee who still lives in town. Along the way the family acquired a hodgepodge of companies specializing in consumer goods and beverages—products like Grandpa’s Pine Tar Soap; Tom Collins Jr.; Bromo Mint, for headache/indigestion relief; Dent’s Toothdrops; and Iron Beer, a root beer-like soft drink that was a big seller in pre-Castro Cuba and Miami. As it turns out, the drink-flavoring headquarters were housed on Kenner Street in the West End. They soon entered the toy business with the Bubbl-Matic Gun (it shot bubbles), concentrating largely on homegrown ideas as opposed to licensed properties. “They felt they had a creative department able to create their own toys, and they had success with that,” says Steiner. Mainly television. The company’s hottest properties were the action figures it produced for The Six Million Dollar Man. 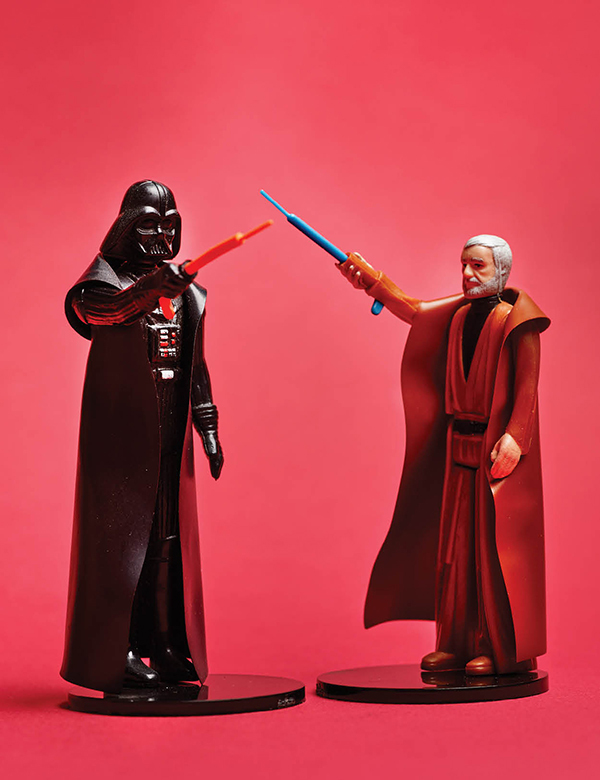 Movies were riskier, notes Jim Swearingen, who was a senior product designer at Kenner in 1976 when a film script for Star Wars came into the office, accompanied by black-and-white photos of its live-action scenes. (By then, the Steiners had sold the company to General Mills, but the offices were still in town.) 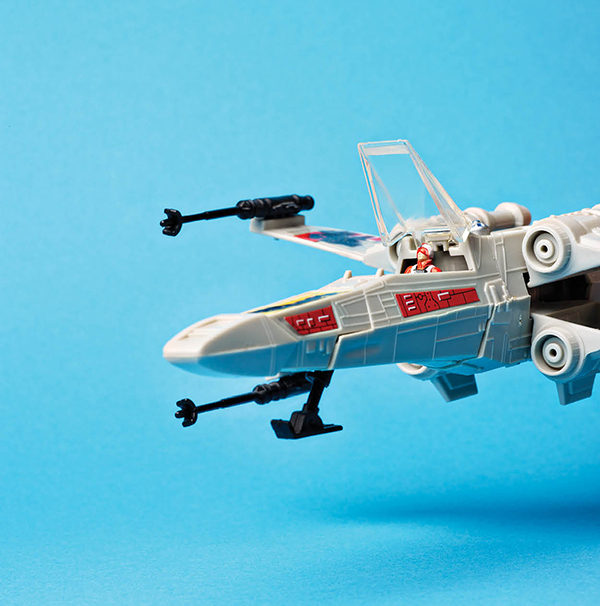 A few other toy companies already had turned down Star Wars licensing, fearing the movie’s spring 1977 release would deem the toys old news when the crucial Christmas sales season came around. It took a while, and when the contract was finally signed between Kenner, Lucas, and 20th Century Fox, it was too close to the movie’s May 25 release date to get toys into the market by the end of 1977. So Kenner came up with the novel idea of selling Early Bird Certificates, each good for four action figures. It was a prescient move. Ultimately, a mere movie—even Star Wars—was no match for the world of corporate mergers and acquisitions. Kenner found itself bought and sold repeatedly over the next two decades until all operations were moved to Hasbro’s Rhode Island headquarters in 2000. Alas, through all the transitions, Kenner’s force began to fade, even as a cultural interest in Star Wars was kept alive via 1997 theatrical re-releases of the original films, a new trilogy of “prequels” starting in 1999, and of course, all those toys. It’s a standalone industry, bloated with Facebook groups and conventions (including one in Sharonville each year), a robust secondary market all over the web, and droves of collectors and fans. But Kenner’s nonexistence is in part what makes its original toys so coveted: They are literally the last of their breed. 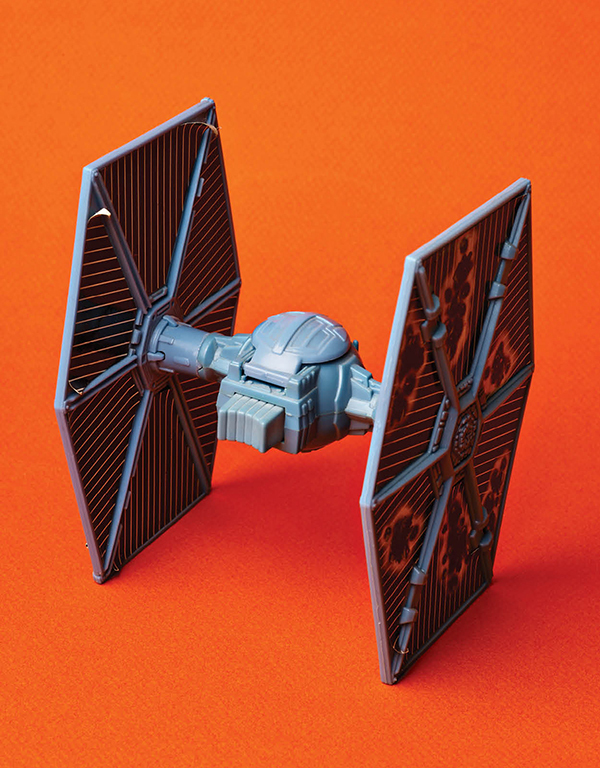 Not surprisingly, Hasbro continues to ride that long tail; they’ve already begun cranking up for a new wave of sales, promoting a line of space-age figures and vehicles from Star Wars: The Force Awakens. It’s a fervor unlikely to fade, as long as there are new movies to entrance younger generations and devoted collectors like Flarida and Blake who eagerly carry the torch—er, lightsaber—for what thrilled them as children. Is it nerdy? Maybe, but nerdy is hot, and Star Wars itself has always been mainstream. Blake jokes about “grown men collecting childhood relics, trying to hold onto the past,” and acknowledges that others might question his priorities.